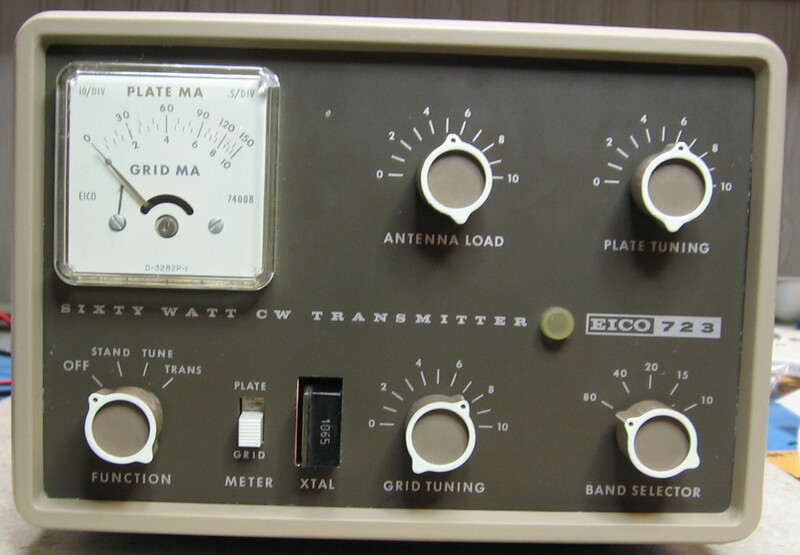 I'm not sure what first attracted me to the Eico 723. 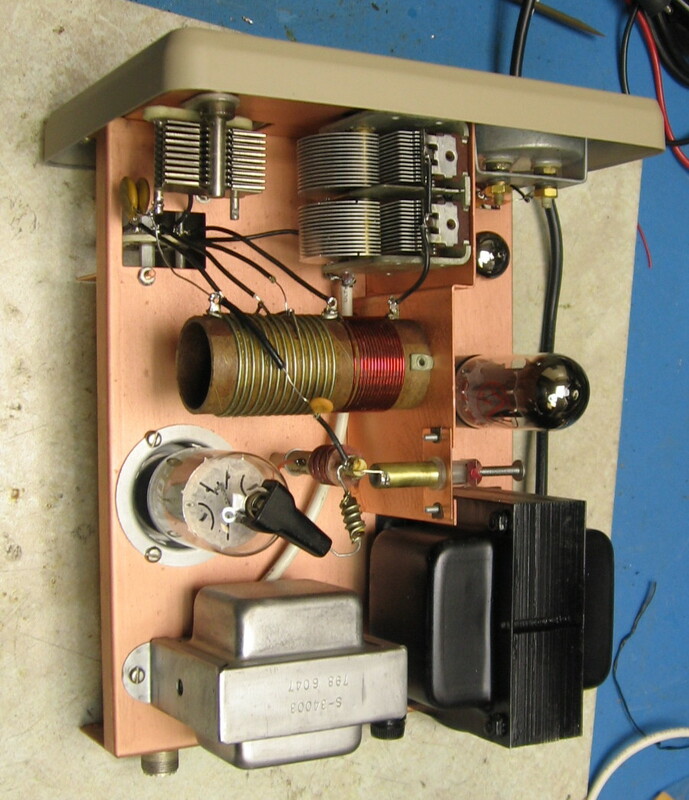 It's a simple 3 tube, cw only transmitter. It covers 80-10 meters, and no WARC bands. I runs about 60 watts output. I purchased one on EBay in February 2006. The cabinet needed repainting, the front panel was in pretty good condition. 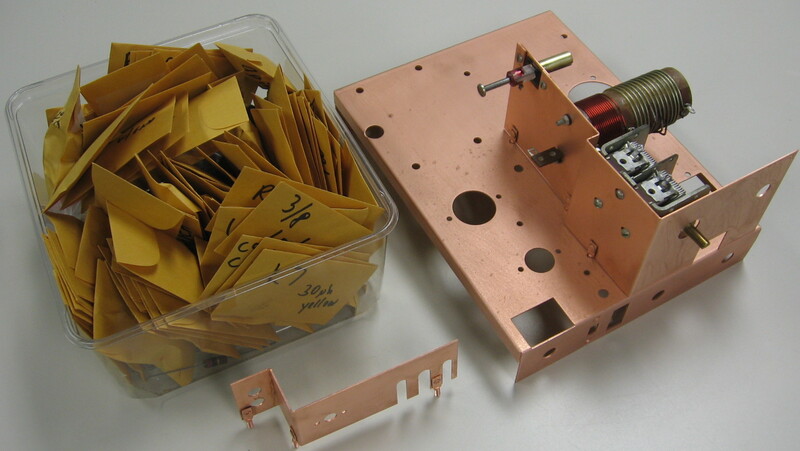 The chassis was okay, but I did have it re-copper plated. I wish I had taken pictures of the unit when received. The wiring was good, but the lead lengths on the components was rather long. I did not even turn it on. I went to work disassembling the unit right away. I used my Hakko 808 desoldering tool, which is the best investment I've ever made. I purchased it at Kiesub Electronics. 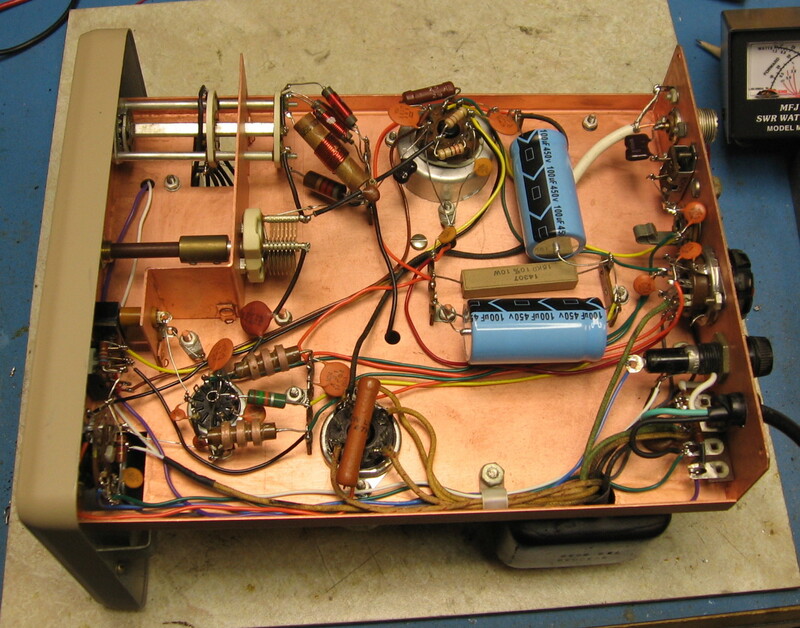 I removed every component from the 723, unscrewed all the tube sockets, variable capacitors and transformers. Cleaned the solder off all components with the Hakko and solder wick. I ordered new capacitors and resistors from Mouser. It was just like building the original kit (although I never had an original kit). I have also restored the knobs, the outside rings were pretty worn. The cabinet and trim ring paint is not the original color, I used camouflage colors from Krylon. This is the completed unit, shown in a few stages. Click on the thumbnails below. The above Eico 723/722 combination is for sale on EBay. I purchased the 723 on EBay. The unit was completely disassembled and rebuilt according to the construction manual (supplied, 1 page missing). The chassis was re-plated. 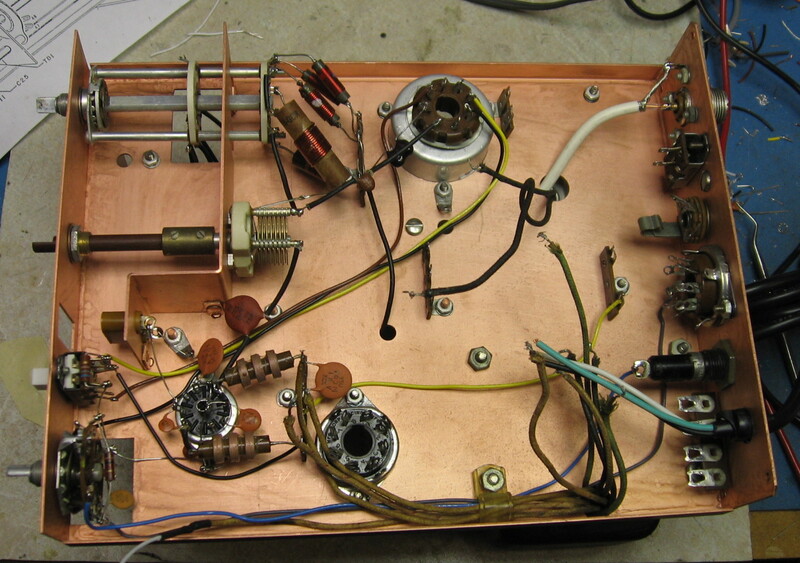 I used new components, except for the coils, variable capacitors, power resistors, tubes, transformer, choke, switches and the meter/chassis/case. It is repainted as stated in the first paragraph. 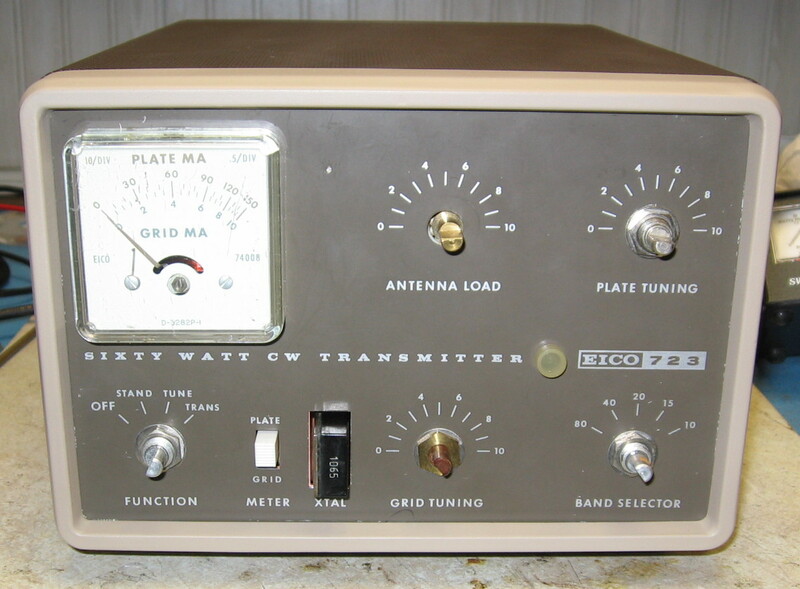 The transmitter puts out about 50 watts. Unfortunately, I have not used it on the air. The one thing I do not like about the transmitter, is the meter. The needle bounces around, when keying. I do not know if there is a fix for this, or just how it was designed [See response from K2GKK/5 below] . The front panel has a small spot showing, as in the close-ups above. There is a small 'scratch' on the right hand side of the meter. The 722 was purchased from a ham in Texas. It was also completely disassembled and rebuilt according to the manual (supplied). The panel SPOT/STBY/TRANS was replaced, as someone had put in a modified toggle switch. The switch I put in works, but the knob is a bit loose. I would probably try to find a better switch. I have the original switch bracket. The front plastic is new. As in the 723, I used all new components, where available. The coils, variable capacitors, transformer, choke, tubes, switches (except as noted above) are original. 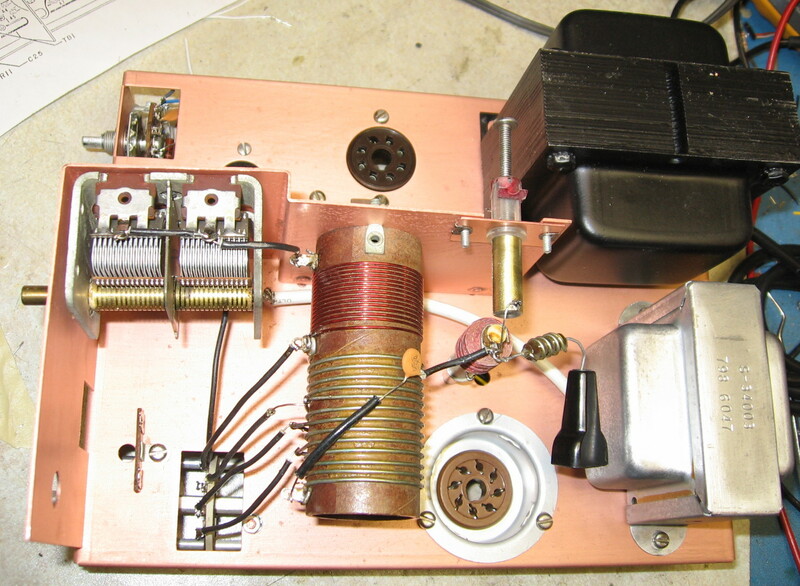 Included is the cable made to connect the VFO output and transmitter xtal socket. I did not restore the knobs on the VFO, as I did on the 723. 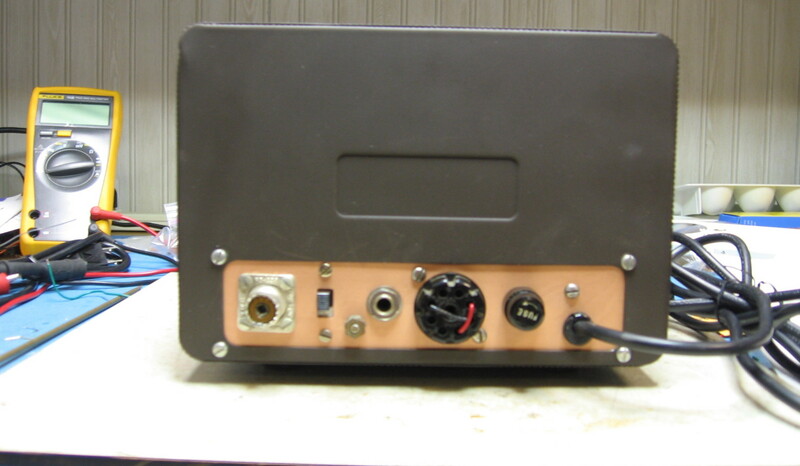 An extra 723 case, bezel and front panel. The cabinet and bezel are in pretty good shape. The fron panel is just OK.
A blank front panel I made (a pretty good copy). Would need to be painted and lettered. 4 extra knobs for the 723. Extra plastic panels (and the original) for the VFO. NOT PICTURED - An MFJ-1708 RF Sense T/R switch. Never used. Manual availabe on the MFJ website. Manuals for both the 723 and 722 are included (assembly and operation). I believe there is one page (bottom illustration) missing from the 723 assembly manual. I will remove the tubes for shipping. Shipping is by UPS ground to the 48 states. Please email me through the EBay email system if you have any questions. I would rather not break up the units. Please remember that the paint colors are not exact. They seem pretty close. I only painted the parts so they would look good in the shack. I'm selling these, as it does not look like I will ever use them on the air. They look great in the shack, along with my Drake 2B/2BQ (soon to be on EBay). My Elecraft K3 #253 has pretty much taken over. Again - PLEASE email me through the EBay email system if you have any questions before bidding. These units are available for pickup on Long Island. use. OR, you could replace the DPDT switch with a DP3T/center off switch.